I've written about perfect games a couple times already this season and in each I've mentioned how I'm tired of writing about perfect games. So I'll keep that part of this column short. Yesterday afternoon Felix Hernandez struck out 12 batters on his way to throwing the 23rd perfect game in Major League history and the 1st for the Seattle Mariners. It was an incredible performance by a pitcher who has been one of the best in the league for about the last four seasons. It was his major league leading 4th shutout of the season and his third this year to end with a 1-0 score. 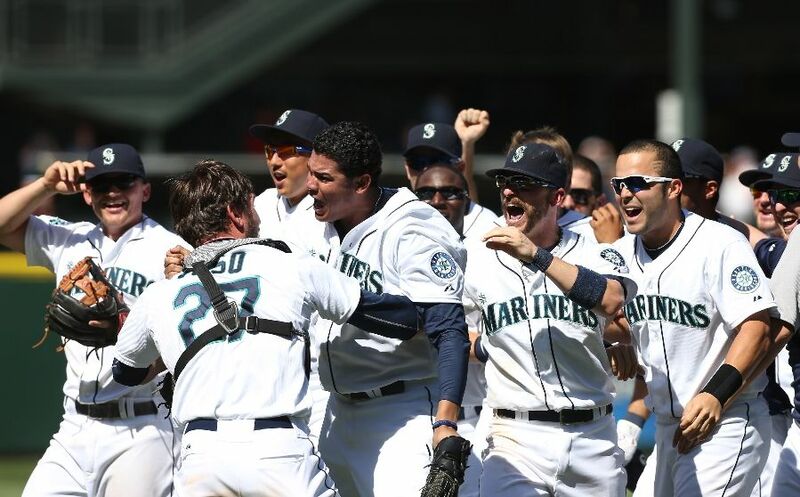 The absolute inadequacy of the Mariners offense made the perfect game that much more impressive to me. Every time Felix pitches he needs to be perfect as one run is usually enough to decide the game at Safeco. So congratulations to Felix, it was an awesome sight to see. What struck me in the aftermath of the perfect game was that Felix became only the second Latino player to throw a perfect game (Dennis Martinez). This struck me as a low number, especially when considering some of the amazing Latino pitchers to have come close enough by throwing no-hitters (Fernando Valenzuela, Carlos Zambrano, Ubaldo Jimenez, Johan Santana, etc.). However in looking at the lists of ballplayers, Latino batters have overall been much more successful than their pitching counterparts. I'm not in any way qualified to determine why this is the case, although I will offer a few possibilities, but it is interesting to examine the facts. I've defined a Latino ballplayer as one who was born in one of the Hispanic or Latino countries. I realize that the definition is much more convoluted than that (Alex Rodriguez was born in New York but spent time as a child in the Dominican Republic and his loyalties were debated at the World Baseball Classic) but I'm looking at a large group of players and a line had to be drawn somewhere and this one seemed appropriate and made for the easiest filtering. In 2011 Latino players made up approximately 27% of the Major League players and 42% of the Minor League players. However the skew in talent favours the batters and has for some time. Of the top 60 position players in terms of WAR (Fangraphs), 20 of them were Latino. The top 20 featured Jose Bautista, Miguel Cabrera, Adrian Gonzalez, Jose Reyes, and Adrian Beltre, and just missed out on other high regulars such as Robinson Cano and Albert Pujols on their "down" years. Conversely, Latinos only represented 12 of the top 60 pitchers and after Felix Hernandez at #10, only Anibal Sanchez and Jaime Garcia even managed to make the top 30. If we look further into the past and at entire careers we see a similar pattern. Of the top 100 batters from 1950-2012, 15 are Latino and are represented mostly by Hall of Famers or future Hall of Famers (Roberto Clemente, Albert Pujols, Rod Carew, Rafael Palmeiro, Ivan Rodriguez, Andruw Jones, Manny Ramirez, Roberto Alomar, Tony Perez, Carlos Beltran, Sammy Sosa, Luis Aparicio, Bobby Abreu, Vladimir Guerrero, Adrian Beltre). Of the top 100 pitchers, only 10 are Latino, and many are known more for longevity than their dominance (Pedro Martinez, Javier Vazquez, Dennis Martinez, Johan Santana, Fernando Valenzuela, Mariano Rivera, Jose Rijo, Felix Hernandez, Livan Hernandez, Freddy Garcia). The same divide exists when we look at major awards. Since 1967 when the Cy Young award was awarded independently to each league, 7 different Latino pitchers have won the award a total of 10 times. Over that same time span 11 different Latino players have won MVP a total of 14 times, although it should be noted that Willie Hernandez falls into both categories, when really as a reliever he should fall in neither. I can't really say why this is the case although I highly doubt it has anything to do with genetics. Pitching is generally a higher injury risk to a player than being a position player. It's possible that injured young pitching prospects in Latino countries don't have access to the required medical care and are forced to give up the sport while their American counterparts can receive the necessary care, rehab, and pick up where they left off down the road. I can't comment on the state of scouting, but Latino prospects are often signed young. A standout 16 year old may not be able to develop all the tools required to make it in the MLB. Conversely a weaker player at that age may be passed over in Latino countries while in the United States the college system would provide more opportunities for development. Perhaps this is all one giant fluke and Latino pitchers are about to become the new market inefficiency. As I said, I don't know nearly enough to create an informed opinion on why this divide exists. What I do know, is that for one night, Felix Hernandez was perfect, and there's no reason to believe it can't happen again.